We visited Turin in June. This was our second trip to Italy. After our arrival in Rome, we took a lovely four hour train ride through beautiful country to Turin. We were lucky enough to stay at the Grand Hotel Sitea (here are the hotel details), and agree with your glowing recommendation. The room was large, and the bed and pillows very comfortable. We loved the city, and it is, like most of the Italian cities we've visited, very easy to walk around, finding interesting sights and sounds all over. Because of my husband's business, we were invited to tour the Lavazza coffee plant, which was a wonderful experience. We always use private drivers in Italy, which has proven to be worth the extra expense. We went to Eataly, because we had visited the one in New York. Great food! Back to the hotel, and after a nap, we started walking, something we do a lot of on our trips. We found the Church of the Shroud, and visited there, although the shroud was not on display at that time, and we went to Mass at another local church. One thing I've found is that churches are not in short supply in Italy! We had great gnocchi and wine for dinner at a small out of the way restaurant, and then headed back to the hotel. One thing we have found is, we never have trouble getting seated at restaurant because we are usually the first ones there. We like to eat early, and many places don't even open their doors until six or later! 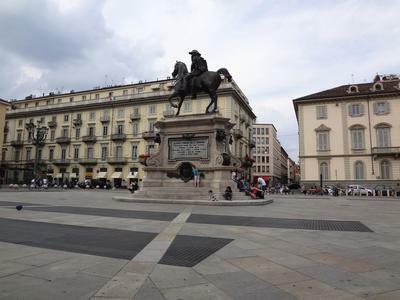 We would recommend Turin to anyone who visits Italy. It's a great place to start your tour if the country. Andrew's reply: I always feel so happy when I read that other's have enjoyed my old home town and found it to be as wonderful as I have always believed it to be. Glad too that the hotel didn't disappoint. 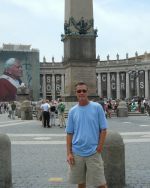 You are right about churches not being in short supply and there are some incredible churches and cathedrals in Turin. The one that I love the most is the absolutely awesome Basilica of Superga situated on a hilltop above Turin. Not only is it an impressive cathedral but the view is unforgettable. You can see Turin stretching out into the distance below and the Alps rising up beyond that. Lastly, thank you very much for taking the time to share your experiences. Maria (my wife) and I really do appreciate it.